The moon has been close and bright these last few frosty nights. 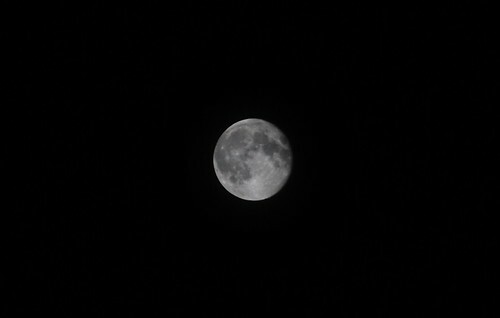 Last night, as the cloud and rain of the day faded away, I opened the skylight and pointed my camera straight up. It took a while to get the right exposure - much faster than I would have guessed. December 2008's full moon, in a clear sky over London. Slight crop from a larger picture. Many lunar photographers fall into the "low radiance - long exposure is necessary" trap, forgetting that the moon - though a long way off - is actually moving rather rapidly! And what -was- the right exposure?